Kathikas is 22kms from Paphos and 14kms from Latchi, 12 km from Coral Bay and has a long history as a resting place for merchants travelling between thePaphos and Latchi, and is halfway between the only road that connects the old and new roads between Paphos and Polis. The remains of a circular Roman road can be seen in Kathikas. Although the historic taverna at this junction no longer exists, it has been replaced by more modern ones, like the Farm Yard Tavern, Araouzos Tavern, Imogens, Petradaki and others. As the village of Kathikas is 600 metres above sea level, it has a good climate in summer with very little humidity. If you're a bit of an amateur anthropologist, then Kathikas is an ideal location in which to observe the traditional Cypriot way of life and to live it yourself. 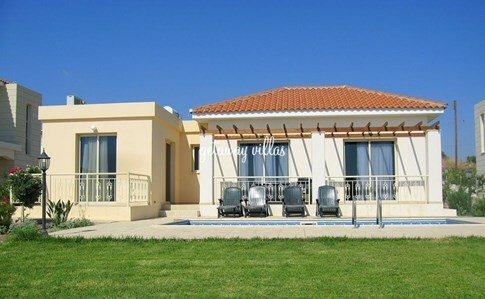 Kathikas' central location makes it an ideal base from which to explore such areas as Polis, the Baths of Aphrodite, the Akamas Peninsula, the turtle hatchery at Lara Bay, to mention but a few. With a population of 349, the village offers something for everyone. Famous for its vineyards, the village is surrounded by vines and is renowned for the quality of its grapes. Many of the vines have been in the same family for generations. Two very famous wineries open their doors to visitors, so you can enjoy the winemaker's craft. The village is also home to a donkey sanctuary and a tourist information centre. From Kathikas you can choose to visit a number of Paphos' best famous beaches.Coral Bay is a short drive to a fully equipped beach with every type of watersports and diving. Latchi has a delightful beach, and again a full selection of watersports. You can hire a boat at Latchi to explore the Akamas coastline. Drop anchor when you feel like it and swim or snorkel in the crystal clear blue waters of the Mediterranean Sea. If you prefer a beach to yourself, try Lara Beach in the Akamas. Even in the height of the summer its almost deserted. The village retains its old world character whilst encouraging selected new developments. There is no main church, but a small chapel serves the needs of the village. The village square has a small taverna where you can enjoy a cool drink whilst sitting under the trees. For fishing fans, the nearest reservoirs are Evretou and Mavrokolympos, whilst the nearest golf course is at Tsada. Read more about Kathikas, at Wikipedia. Up to 15% off, if you book within 43 days of your start date. 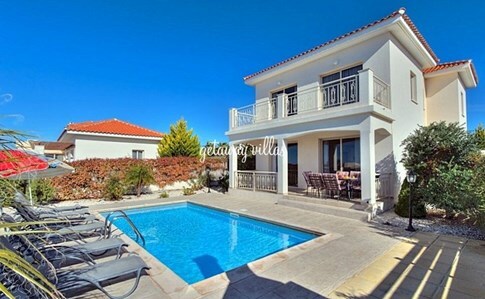 Click on the villa picture for more info.